McGrath’s can help you with all your commercial waste management needs. We have been in the waste business for over 40 years. Whether it’s a large or small scale project, a one off or an ongoing contract, we shall use our experience and expertise to meet your specific needs providing a fast, reliable & professional service. Weekly waste collections for businesses are available. We have been with McGraths for years and like ourselves they are a family run business. They give that personal touch. From Joe on the truck to Nora and Paddy the director’s they are down to earth and friendly. They are a pleasure to deal with. A very big thank you to your bin collection men, who came out and did their job, despite the appalling road conditions, well done. I have found McGrath Waste to be reliable, flexible and value for money in all our transactions over the past 20 years. I have been with McGrath’s for 9 years now, the lads on the run are so pleasant and reliable. I wouldn’t leave McGraths as I know I am supporting a local company and they provide a great service. Allergan Pharmaceuticals have been using McGrath Waste for disposal of general waste and recycling since we opened in Westport over thirty years ago. 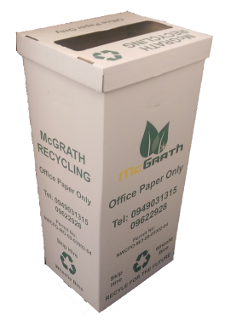 We find McGrath Waste an excellent supplier and have no hesitation in recommending them to other customers. We find McGrath’s service very efficient, even over the Christmas period with frost and the snow our bins were emptied. For 34 Years, we have been dealing with McGrath Industrial Waste Ltd. During which time they have provided our business with an excellent service. We use McGrath’s skip hire, they are always prompt in exchanging our skips for us. They are both reliable and professional.